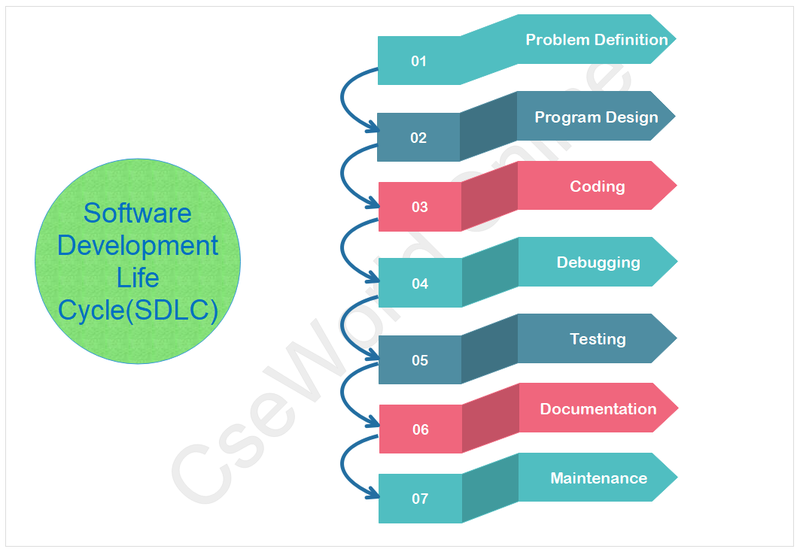 The first step in the process of program development is the thorough understanding and identification of the problem for which is the program or software is to be developed. In this step the problem has to be defined formally. All the factors like Input/output, processing requirement, memory requirements, error handling, interfacing with other programs have to be taken into consideration in this stage. The next stage is the program design. The software developer makes use of tools like algorithms and flowcharts to develop the design of the program. Once the design process is complete, the actual computer program is written, i.e. the instructions are written in a computer language. Coding is generally a very small part of the entire program development process and also a less time consuming activity in reality. In this process all the syntax errors i.e. errors related to spelling, missing commas, undefined labels etc. are eliminated. Avoiding jumps in the program to transfer control. At this stage the errors in the programs are detected and corrected. This stage of program development is an important process. Debugging is also known as program validation. Reversing of order of operands. Confusion of numbers and characters. Inverting of conditions eg jumping on zero instead of on not zero. The program is tested on a number of suitable test cases. A test plan of the program has to be done at the stage of the program design itself. This ensures a thorough understanding of the specifications. The most trivial and the most special cases should be identified and tested. It is always useful to include the maximum and minimum values of all variables as test data. Documentation is a very essential step in the program development. Documentation help the users and the people who maintain the software. This ensures that future modification if required can be done easily. Also it is required during redesigning and maintenance. Updating and correction of the program for changed conditions and field experience is accounted for in maintenance. Errors which are found during the actual execution of the program.